Ecology is the study of natural systems and how organisms relate to their physical surroundings. So what the heck does that have to do with architecture and why should I care? Eric and I discuss what exactly ecology is and the benefits of teaching it in architecture school. We also discuss how it is a basic fundamental understanding of the way nature works and why it is beneficial to architects to better understand the core principles. In this week’s NCARB news, we talk about NCARBs vision of integrating academic, IDP and access to the ARE divisions within the framework of an accredited degree program. The article is called “Over 30 Accredited Architectural Schools Indicate Interest in NCARB Proposal for Integrated Path to Licensure Initiative”, be sure to check it out! Where did this material come from? What are the by-products of its’ manufacturer? How is the material delivered and installed? How is the material maintained & operated? How healthy are the materials? What do we do with them once we are done with these materials? Bill Mollison book: Check out the book! Earthships: Michael Reynolds in Taos, New Mexico: Check out the book! 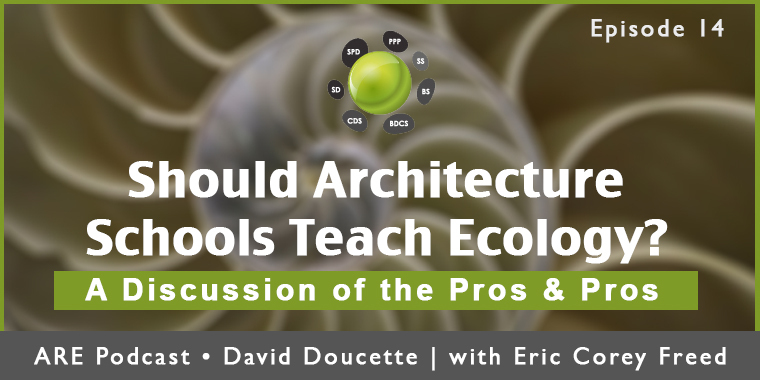 Should the study of ecology be taught in architecture school? Let us know what you think in the comments below. The very fact this is a question is greatly disappointing and even depressing. You guys know this, of course……..so thanks. Bill Mollison is not dead! Hi William, hopefully we will see a change with younger architects leading the movement!